It's never too soon to protect yourself against fraud after your credit card application is approved. Credit card fraud costs businesses hundreds of millions of dollars each year, resulting in higher prices for everyone. It also wreaks havoc in the lives of card holder victims who must scramble to correct their accounts and credit reports. 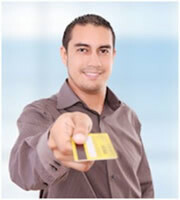 Take the following four steps to ensure your new credit card account gets off to a safe start. When you know you'll be receiving a credit card in the mail soon, keep a close eye on your mailbox to prevent thieves from stealing the card. Or consider having the new credit card sent to a locked post office box. You might have heard people advise against signing the back of your credit card and to instead write "Check ID" as a way to deter credit card fraud. But rather than preventing criminals from using your credit card, that strategy could prevent you from being allowed to make a purchase. Credit card companies tell merchants that unsigned credit cards should be considered invalid and that "See ID" or "Ask for ID" is not a substitute for a signature. The merchant is not supposed to authorize the purchase if the customer refuses to sign the back of the credit card. Follow instructions to activate your credit card. In some cases, the card may be blocked from use until you activate it. In others, you may be able to make small purchases. Use your home phone to complete the activation process. This lets the card issuer know the credit card arrived at its destination. Some card issuers may let you activate the credit card online if, for instance, you already have an online bank account with the issuer. As a safeguard against hackers, avoid using public wireless Internet access or public computers to activate your new credit card account or do any online financial transactions. Write down the credit card account number and the toll-free credit card issuer's number, and keep it in a safe place in case the card gets stolen. By following these precautions, you are off to a good start protecting your credit card from fraud. 0 Responses to "Protecting Your New Credit Card: Four Steps to Get Your Account Off to a Safe Start"